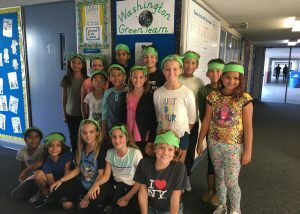 Congratulations to Washington’s 2017-2018 Green Team! Our new Green Team for the 2017-2018 school year is off and running! With the help of Washington moms Kathleen Jacecko and Christine Wilkas, the Green Team will be taking on several projects, including: campus cleanups, helping fellow students sort their trash at lunch, establishing an “idle-free zone” in front of the school to save fuel and improve air quality, and petitioning local restaurants to adopt eco-friendly practices. The Green Team will also once again play a key role in Washington’s Earth Day Fair, coming up in April 2018. Stay tuned for much more on that! Working together, this team of sixteen environmentally-conscious 4th and 5h graders will be working hard to raise environmental awareness on campus and ensure that Washington Elementary fulfills its commitments as a California Green Ribbon School. We hope you will stop by the Green Team bulletin board in the main hall to learn more about environmental topics and green happenings on campus. And if you spot our Green Team members sporting their green bandanas, be sure to say hi! 2. Not waste food or water. 3. Avoid using disposable straws. 4. Pick up litter and keep our school clean. 5. Try to walk, bike, scooter or carpool to school. 6. Pack a waste-free lunch and snack using only reusable containers. 7. Use a reusable water bottle – and our hydration stations – whenever possible. 8. Sort our waste into trash (grey bin), recycling (blue bin) and compost (green bin). 9. Save energy by turning off lights, electronics and air conditioning when not in use. 10. Encourage others to do all of the above and more!